This is one of my favorite swimming pool designs! 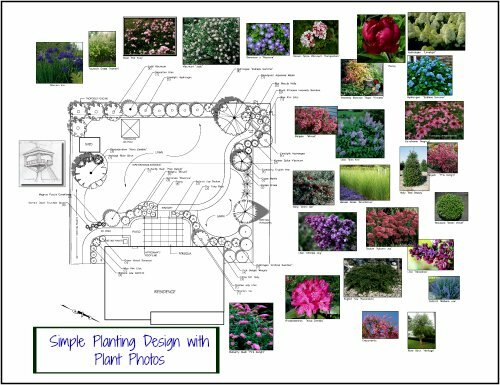 In this project, not one, but many special features made it spectacular. One of the first things you notice is that this is one of those enchanting infinity pools. 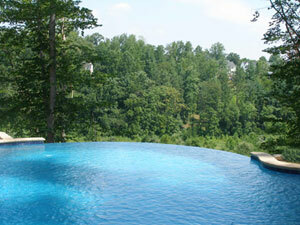 The back yard was elevated high above a mountainside so this type of pool worked beautifully. Viewing the edge along with the distant body of water was enchanting. A tanning shelf with wide, curvilinear steps was also included. The homeowners could actually sit in the water with their chairs. There is also the magnificent waterfall! I actually stood there supervising the position of every rock to make it look as natural looking as possible. 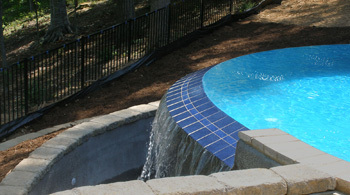 The pool elevation must be above grade for this to work so that the back of the edge can cascade into a lower area. Here, the edge becomes extremely dramatic due to the fact that the pool is perched high above the distant body of water, with a mountain in between. 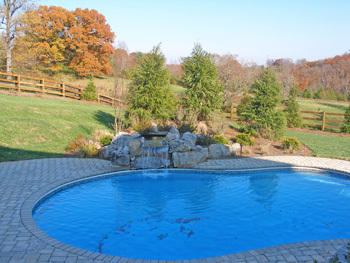 The elevation of the pool was carefully set to take advantage of this beautiful location. 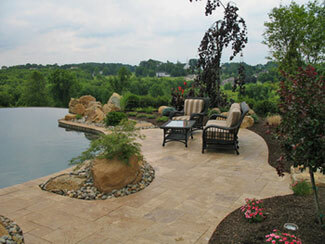 Find out the cost of this travertine paver pool decking! 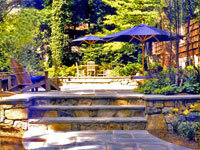 I also compare it to the pricing for pavers, concrete and bluestone. When designing an infinity edge (also know as a negative or disappearing edge pool), it is important that the basin area not be seen. Here, it was hidden from the main pool paving area and also from the existing upper deck. I enjoyed design the curve of this water cascade. 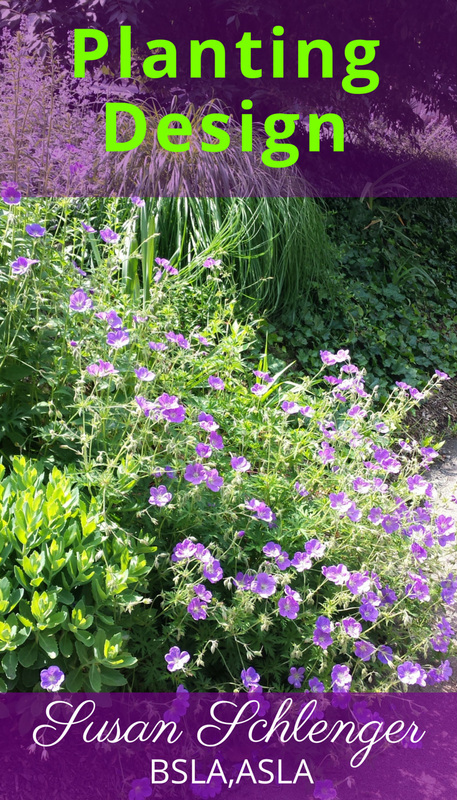 However, many designs such as this are also made with straight edges. Also included in this swimming pool design is a tanning shelf. 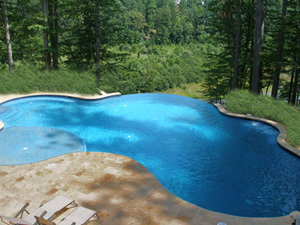 This is an area of the pool with only about six inches of water so that lounge chairs can be placed right in the pool. River Rok was used, as opposed to plaster, in the tanning shelf area and also for the pool steps. River Rok gives a pebbled appearance and also keeps the areas from being slippery. 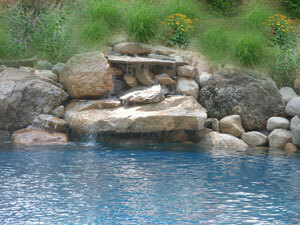 The natural stone waterfall is another great feature. Each boulder and stone was individually selected to create a natural scene that you might stumble upon in a national forest. There is a main waterfall spillway, and water also trickles down from the upper parts of the waterfall. The waterfall design is comprised of many large boulders and smaller stones for diversity. There is also a love seat with jets for that soothing water massage. The disappearing edge, waterfall and love seat jets can all be operated singly or together. Of course when all are operating at the same time, that is the most exciting! For the swimming pool decking, travertine pavers, a beautiful natural stone product, were used with a matching pool coping. 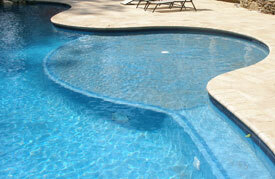 Travertine pavers are cool to the touch - they are a wonderful choice for swimming pool decking.